The old adage: “Drive for show, putt for dough” only works if your driver works. If your driver is a “no show,” the dough is long gone before you get to putt. With that in mind, there’s never been a better time to find a driver that fits your swing. Instead of trying to change your swing to fit the driver you bought, it’s time to buy a driver that fits your swing. You’re a golfer who “grips it and rips it”? Find a driver that helps you control aim and trajectory. You’re more of a cautious driver who doesn’t get too far down the fairway? Find a driver that will not take away from your accuracy but will help your distance? If you’re happy to be able to find your ball after your drive, there’s a driver for you too. The trend among many golf-club manufacturers seems to be toward forgiveness, at least if you listen to the marketing. A lot of the manufacturers are adding enhancements, or changing designs, to benefit the “at risk” golfer. Manufacturers are still pouring millions of dollars into advertising their drivers. They know that every hole starts with your drive, and therefore your feelings about that hole, or maybe even your entire round, will be affected by how you’re doing off the tee. They have some creative names for those drivers, like “King Cobra” and “Launcher,” which remind you that “size matters” to some technical names like the Ping G400, Calloway GBB Rouge Series and the Titleist TS2 and TS3 drivers, which don’t tell you anything about the clubs. You’ll have to believe them that it will work for you. Here are just a few drivers that are grabbing attention of solution-seeking golfers. Technically called the Cobra King, the F8 and F8+ drivers’ precise weight-saving tolerances are designed to lead to better performance. Cobra uses automated computer milling to form its titanium face inserts. This saves weight and allows the face to feature subtle curvature for more speed and higher launch on mishits. The high-launching F8 and low-spin F8+ have lightweight carbon-composite crowns and movable sole weights. “The KING F8 Driver introduces COBRA’s first CNC milled driver face paired with 360° Aero™ Technology, bringing you COBRA’s smartest, fastest, most precise driver ever,” according to the company’s web site. “(It has an) oversized shape for maximum forgiveness. Cleveland is one of the major manufacturers that is thinking about the average golfer as much as the professional. The design of the Launcher means the club has no moving parts. There is no adjustable hosel and no movable weights. It might seem basic, but the simplicity serves a purpose. Cleveland engineers believe that most golfers need forgiveness on mis-hits and a higher launch. Any feature that doesn’t work toward those objectives is a waste of material and unnecessarily confusing. Here, all the weight saved from not having adjustable features is pushed low and deep for higher launch and added forgiveness for off-center hits. A stepped crown and sole are designed to enhance the flexing of the face for better distance. The new M4 driver is the more forgiving and non-moveable weight relation to the M3. It replaces the M2 version from last year. It bears the same facial features as the M3, with the latest “Twist Face” design, a new take on the age-old “bulge and roll” design of woods. 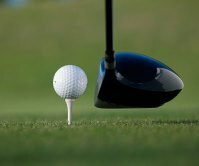 This vertical and horizontal curvature of the face creates a gear effect that puts opposite spin on the ball. The effect of that spin aims to cause mis-hit drives to head back towards where they were intended. What TaylorMade has done is re-visit this fundamental belief of face design and, through analysis of data from 500,000 shots, saw that most players will miss the center low in the heel or high in the toe. High-toe shots that come off with less spin and a draw bias hopefully will have a higher launch with extra spin than before because the contour of the Twist Face adds this. The reverse is true for the heel area where a delofted area takes spin off and changes the face angle to stop the ball from going high and to the right. The difference between the M3 and the M4 is slight. The M3 features the Y-Track, which has a simple and intuitive system to move weight and personalize ball flight for draw/fade/high/low. Tracks are connected for the first time, allowing for an unrestricted movement of 22g of mass. The back Y-portion provides forgiving draw and fade options. Splitting the weights provides the ultimate in forgiveness. The M4 features is shaped for a solid and more explosive sound. It also has a reduced sole volume enables a larger, more forgiving face. Ping also is trying to push the limits of how to make your worst misses more playable. The G400 comes in four models, including its standard model, the low-spin LST, the slice-fighting SFT and the new oversize Max that is designed for stability. The large front-to-back shape and thin crown work with a tungsten weight deep in the sole to make these Ping’s most forgiving heads ever, even though all but the Max are smaller than any G-series driver in history. All four designs feature Ping’s familiar drag-reducing ridges on the crown to make the large head glide through the air like a much smaller driver. The Callaway web site is quite proud of the new Rogue driver, and, starting at $499, the cost reflects that. The Rogue driver comes in various shapes and sizes, including the Draw Custom Driver and the Sub Zero Custom Driver. They all feature a series of technologies that work together to promote faster ball speed. Two in particular—Jailbreak and X-Face VFT (Variable Face Thickness) technology—support each other in an especially critical way. Jailbreak’s function remains the same. The bars’ position inside the head, behind the face, effectively stiffens the body to prevent the crown and sole from deforming and bulging outward at impact. That changes how the face behaves at impact, allowing it to focus more energy on the ball. Callaway calls that “Energy Lensing,” and it promotes more ball speed for longer distance. What has changed about Jailbreak is the shape and weight of the bars. Their new, hourglass shape makes them 25 percent lighter than first-generation Jailbreak bars. Titleist’s brand new TS series seems to be focused on the high-level players. The drivers were just made available to the public this month. According to them: “It began with a challenge from the game’s greatest players. A mission to solicit speed from every detail of the driver, embarked on by a collection of uniquely-gifted R&D minds. The TS Project is a peerless pursuit of speed where every micron and milligram matter. There is a difference between the TS2 and TS3. The TS2 lets you swing aggressive with maximum forgiveness across the face, while TS3 offers an adjustable sweet spot for speed-tuned performance.